There is plenty to do in Cromarty. Go for a stroll around the town, wander along one of the beaches and visit the harbour or go for a bracing walk around the Sutors and onto Macfarquhars Bed. You can visit the award winning Cromarty Courthouse Museum, see Hugh Miller's Cottage and the new Miller House Museum and visit the finalist in Restoration Village 2007 - Cromarty's East Church. Take a wander around the interesting shops, which include an antique shop, the Cromarty Pottery, Gallery 48, Ingrid's House and the Emporium Bookshop with it's wide range of new and used books plus jewellery, toys, cards and gifts. Cromarty also has a bakery which supplies wonderful bread and cakes to many establishments throughout the Highlands; a post office, cheese shop and a general store. The award winning Cromarty Brewery just outside Cromarty is well worth a visit. The great outdoors are on the doorstep making Cromarty a great destination for outdoor activities. A visit to Cromarty would not be complete without a dolphin spotting trip with Ecoventures.from the revamped Cromarty harbour on their brand new rib (rigid inflatable boat). If you don't want to venture too far - you could always try Cromarty's "grey ground". The only park in the Highlands with outdoor gym equipment. There is a choice of places to eat. Sutor Creek, with it's wood fired oven, The Royal Hotel and Cromarty Arms Inn also provide home cooked meals. For light lunches and teas you can visit Coupers Creek. The Emporium Bookshop and Slaughterhouse Cafe are great places for coffee. The mountain bike trails at Red Rock are probably about the best in the country. We have secure storage available for your bikes. Udale bay is an ideal bird watching spot. Come for an hour or two either side of high tide to be rewarded with spectacular views of flocks of flying bards. 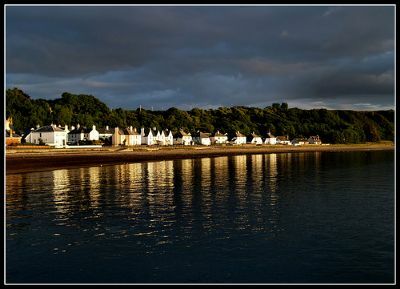 Cromarty is an ideal place to base your Highland holiday. We are 30 minutes drive from the Highland Capital of Inverness with all its attraction. Loch Ness is nearby and there are plenty of castles and distilleries to visit within the vicinity. Read this article on Cromarty from BBC News, or this one from The Guardian, or Ian Rankin's article on Cromarty in The Telegraph. What's on in Cromarty? Look at Cromarty Live or keep up to date with all things Cromarty by following Sydney House on Facebook.